关云琦, 张梅, 张笑, 赵振平, 黄正京, 李纯, 王丽敏. Guan Yunqi, Zhang Mei, Zhang Xiao, Zhao Zhenping, Huang Zhengjing, Li Chun, Wang Limin. Guan Yunqi, Zhang Mei, Zhang Xiao, Zhao Zhenping, Huang Zhengjing, Li Chun, Wang Limin. Medical treatment seeking behaviors and its influencing factors in employed floating population in China[J]. 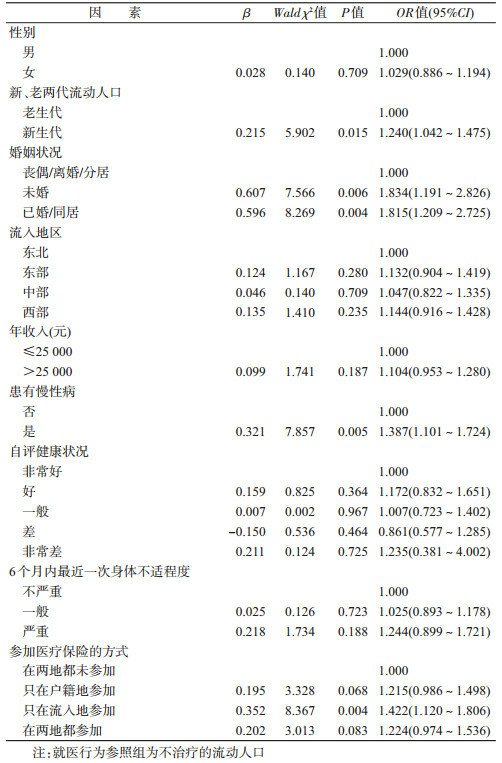 Chinese Journal of Epidemiology, 2019, 40(3): 301-308. Abstract: Objective To understand medical treatment seeking behaviors and its influencing factors in employed floating population in China and provide evidence for the development of health service policies for floating population. Methods Data were from the national chronic disease and risk factor surveillance (floating population part) in 2012. Floating population were selected through multistage clustering sampling stratified by industries in 170 counties and districts from 31 provinces (autonomous regions, municipality directly under the central government) and Xinjiang Production and Construction Corps in the mainland of China. Information on demographic basic information, health status and health seeking behaviors six months before the investigation were collected through face-to-face questionnaire interview. The people aged 18-59 who had physical discomfort in the past six months was analyzed. After complex weighted analysis, multinomial logistic regression model was used to analyze the health seeking behavior and its influencing factors in the employed floating population. Results A total of 11 134 suitable people aged 18-59 years were included in the study. The number and proportion of the people seeking medical treatment, having self-treatment and having no treatment were 4 950 (44.5%), 3 880 (34.8%) and 2 304 (20.7%), respectively. Multinomial logistic regression analysis showed that women were 1.275 times (95% CI:1.100-1.477) more likely to seek medical treatment compared with men. The medical treatment seeking rates of floating population in the eastern, central and western areas were 2.153 times (95% CI:1.669-2.777), 2.310 times (95% CI:1.777-3.002), 2.177 times (95% CI:1.695-2.796) higher than that of floating population in northeastern area. 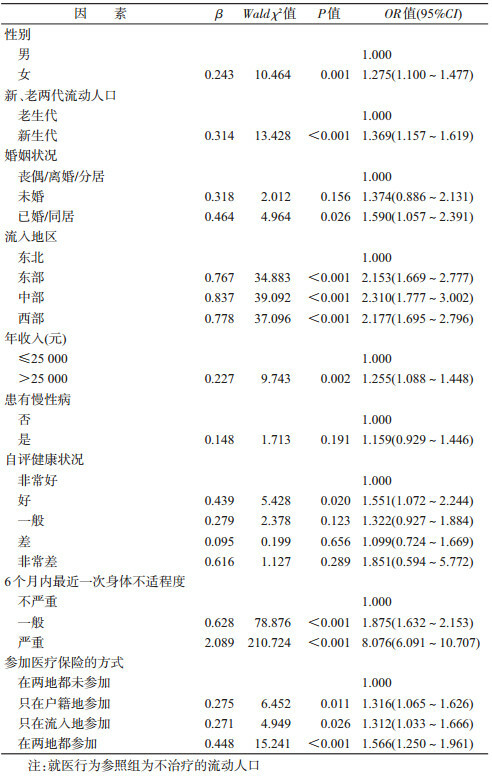 In terms of seeking treatment, the proportion of the floating population with annual income of more than 25 000 yuan was 1.255 times (95% CI:1.088-1.448) higher than that of the floating population with annual income of 25 000 yuan or less than 25 000 yuan. The proportion of the floating population with severe physical discomfort within the past six months was 8.076 times (95% CI:6.091-10.707) higher than that of the floating population without severe physical discomfort and the proportion of the floating population who participated in medical insurance in both original living places and current living places was 1.566 times (95% CI:1.250-1.961) higher than that of the floating population who did not participate in medical insurance in two places. The incidence ratio of medical care seeking and self-treatment in new generation of floating population was 1.369 (95% CI:1.157-1.619) and 1.240 (95% CI:1.042-1.475) compared with old generation of floating population. Compared with the widowed/divorced/separated, the incidence ratio of medical treatment seeking and self-treatment for the married/cohabited was 1.590 (95% CI:1.057-2.391) and 1.815 (95% CI:1.209-2.725). The more severe physical discomfort, the higher level medical institutions they chose (P < 0.05). Conclusions The treatment rate in medical institutions of employed floating population was low in China. Gender, generation of floating population, marital status, area, annual income, severity of physical discomfort in past six months and the way to participate in medical insurance were the main factors affecting the medical treatment seeking behaviors of employed floating population. 国家卫生和计划生育委员会流动人口司. 中国流动人口发展报告2016[M]. 北京: 中国人口出版社, 2016. Population Services and Administration, National Population and Family Planning Commission. Report on China's Migrant Population Development 2016[M]. Beijing: China Population Press, 2016. 郭静, 翁昊艺, 周庆誉. 流动人口基本公共卫生服务利用及影响因素分析[J]. 中国卫生政策研究, 2014, 7(8): 51-56. 中国疾病预防控制中心, 中国疾病预防控制中心慢性非传染性疾病预防控制中心. 中国流动人口慢性病及其危险因素专题调查报告-2012[M]. 北京: 军事医学科学出版社, 2015. Chinese Center for Disease Control and Prevention, National Center for Chronic and Non-communicable Disease, Chinese Center for Disease Control and Prevention. Report on Chronic Disease Risk Factor Survey Among Floating Population in China (2012)[M]. Beijing: Military Medical Science Press, 2015. National Bureau of Statistics. Division method of east region, west region, central region and northeast region of China[EB/OL]. Beijing: National Bureau of Statistics.(2011-06-13)[2018-07-20]. 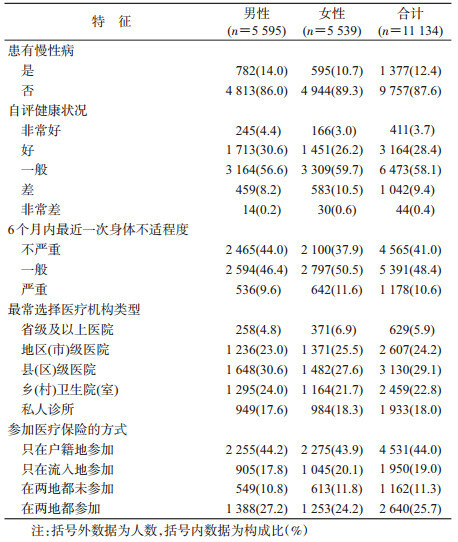 http://www.stats.gov.cn/ztjc/zthd/sjtjr/dejtjkfr/tjkp/201106/t20110613_71947.htm. 姚兆余, 张娜. 农村居民就医行为及其影响因素的分析——基于苏北地区X镇的调查[J]. 南京农业大学学报:社会科学版, 2007, 7(3): 12-17. Center for Health Statistics and Information. 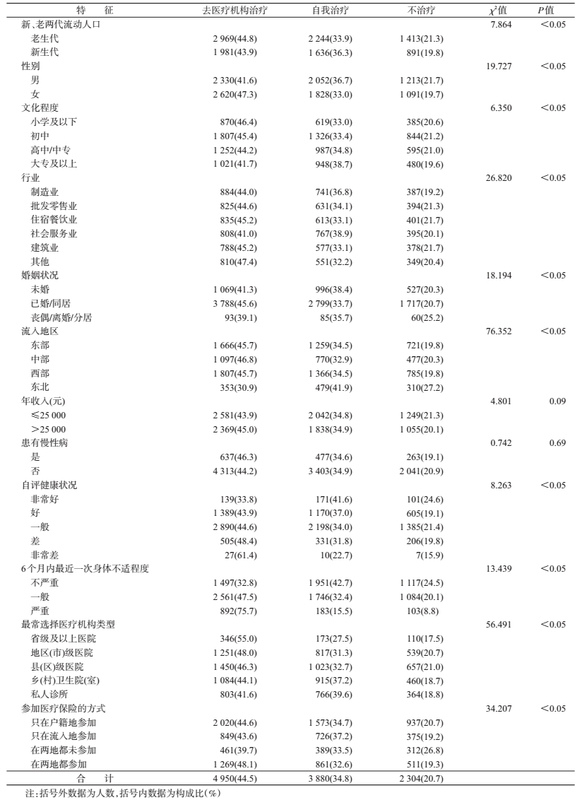 An analysis report of national health services survey in China, 2013[R]. Beijing: Center for Health Statistics and Information, 2016. 郭静, 周庆誉, 翁昊艺, 等. 流动人口卫生服务利用及影响因素的多水平logistic回归模型分析[J]. 中国卫生经济, 2015, 34(3): 50-52. 蔡滨, 柏雪, 殷群, 等. 基本医疗保险重复参保现象研究[J]. 中国卫生经济, 2012, 31(4): 34-36. 蔚志新. 就业流动人口的单位分布及其社会保险参与状况分析——基于106个城市流动人口动态监测数据结果[J]. 西北人口, 2012, 33(6): 95-102. Hubbell FA, Waitzkin H, Mishra SI, et al. Access to medical care for documented and undocumented Latinos in a southern California county[J]. West J Med, 1991, 154(4): 414-417. 曾智, 陈雯, 夏英华, 等. 广州市户籍人口与流动人口就医行为差异及影响因素分析[J]. 中国卫生事业管理, 2012, 29(6): 417-419, 450. 杜本峰, 韩筱, 付淋淋, 等. 流动人口医疗卫生服务需求、供给、利用与健康促进策略选择——基于医疗服务利用行为模型视角[J]. 中国卫生政策研究, 2018, 11(2): 23-29. 唐雨萌, 李茜, 何田静, 等. 中国流动人口就医行为研究进展及启示[J]. 中国社会医学杂志, 2016, 33(5): 435-438. 江婷婷, 赵颖智, 石智雷. 流动人口就医行为及公共卫生服务利用质量分析——基于湖北省2013年流动人口动态监测调查[J]. 宏观质量研究, 2015, 3(1): 111-119. 王恩来, 那军, 李少鹏, 等. 流动人口卫生服务利用及影响因素分析[J]. 现代医院管理, 2017, 15(4): 25-28.